Sometimes a memorable meal transcends your kitchen tools and cooking techniques. Instead, it’s a celebration that connects you to your friends, family, and culture. That’s what happens when you cook a leg of lamb. It isn’t particularly complicated, but the result is magical. If you appreciate the cut and revere the process, history will carry you along. 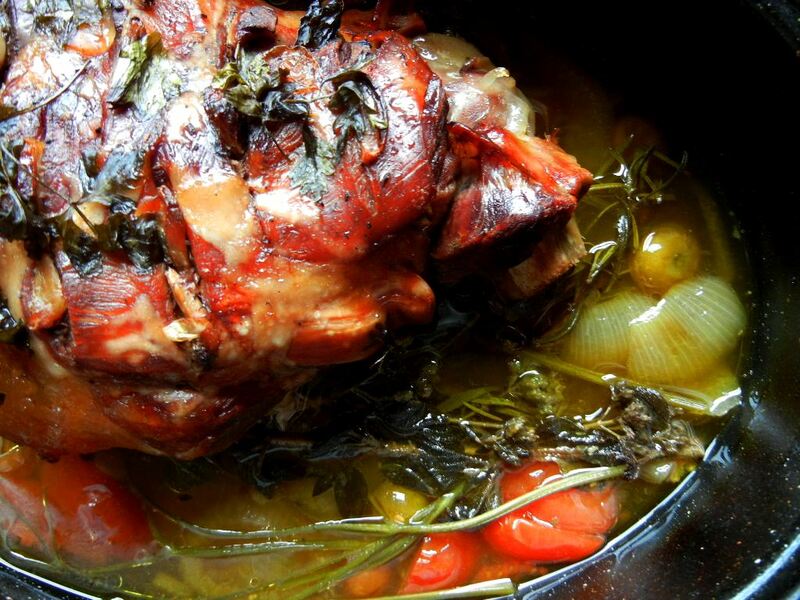 Lamb is the centerpiece of celebrations on every continent. And the leg of lamb is the most sought after cut. It’s lean, forgiving, and can take on flavors through marinading, grilling, roasting, or braising. Most importantly, though, its sublimely delicious and it makes enough to share. I simply scored the fat in a crisscrossed pattern and arranged a handful of garlic cloves in the cuts. After seasoning quite generously with salt and pepper, I placed it in a roasting pan with diced carrots, onions, peppers and tomatoes. About an inch of water and a bouquet garni later and the hard part was done. Cover it tightly with foil, then its into the oven at 300F for five hours or so, checking the liquid level at the halfway point. Then invite friends, family or both, and serve it with white beans and white wine. But really, you should let your imagination be your guide. It’s not everyday that you find yourself in possession of such beautiful meat (thank you dearly, Kate), so use the opportunity to celebrate and share your life. Playlist included Rue St. Vincent, par Yves Montand. As it turns out, you can recreate this shared food experience at home, because it’s pretty easy. Not only do you not have to precook the beans, there’s not even really a recipe to it. Feel like including some parsley? Do it. Don’t have any onion? Skip it. 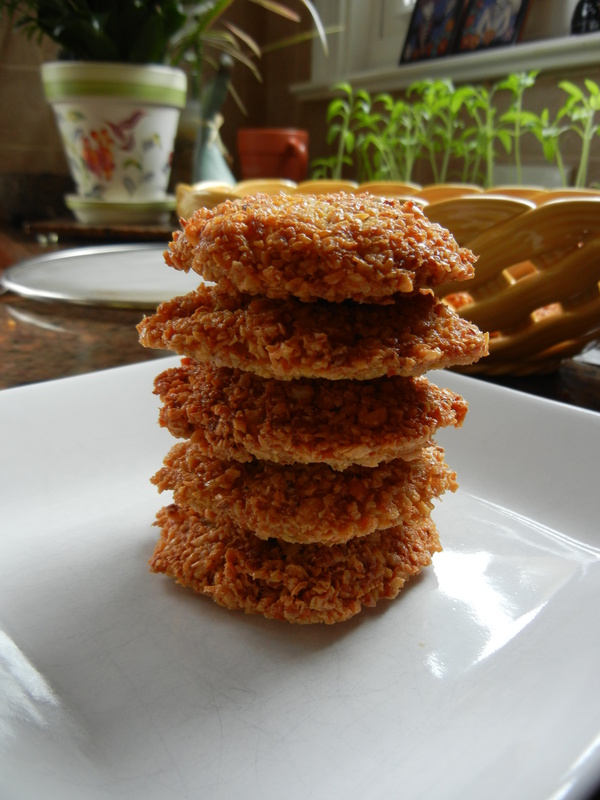 When I made these recently, I couldn’t help myself from nibbling on them once they had cooked most of the way: quickly snatching one at a time with asbestos fingertips from the top of the pot and popping it in my mouth, or Cherub’s, if she happened to wander through the kitchen. They are surprisingly delicious as a snack. I almost always hate to say how good something is for you. People never want to eat it then, it can’t possibly taste good. But these, in addition to being downright addictive and snackable, are full of protein, fiber and an impressive amount of trace minerals including 71% of your folate (anybody pregnant out there?). 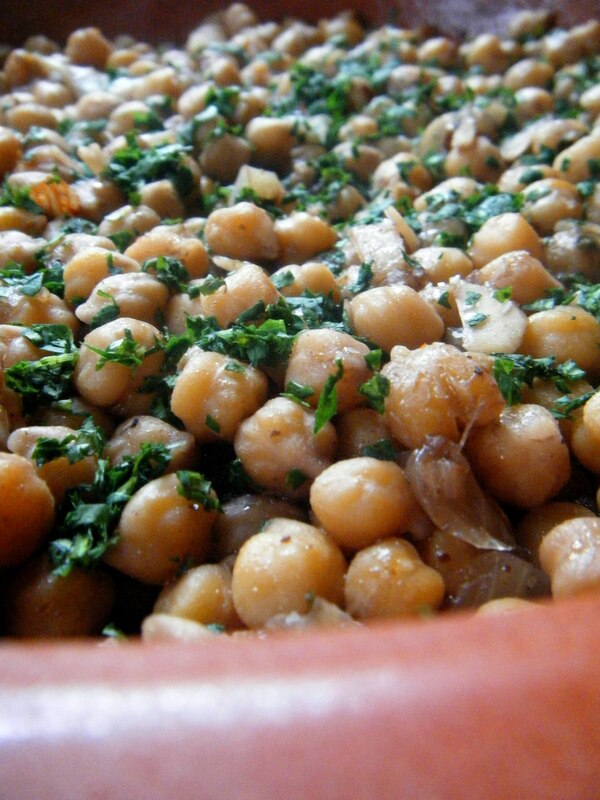 They also work beautifully as a side dish to lamb or chicken with heady, Moroccan spices. Or transformed, as I will later tonight, into falafel, which is an ideal meal for the meatless Fridays during Lent. And you can always whip up leftovers into a quick batch of hummus. Everyone had been told to batten down the hatches, so we did. Buying a whopping two days worth of dinners and lunches at once. Persephone is a daily grocery shopper. It is somewhat a product of my Europhile nature, as well as, and perhaps more importantly, a morning activity with Cherub. The life of a SAHG (stay at home goddess) is nothing, if not glamorous. Besides, who knows what I will want to cook for dinner? I just can’t muster a week’s menu. I applaud those who can, but… Oh! Excuse me, this was a major digression. Perhaps it’s the lack of adult conversation as well. Ahem. Moving on. There are few things that seem to go better together with a fennel spiced sausage than some simple creamy white beans. Not the kind from a can; the kind that take a couple of hours on very low heat, simmering with olive oil, garlic, carrots, bay, thyme. Polenta comes in a very close second for me. 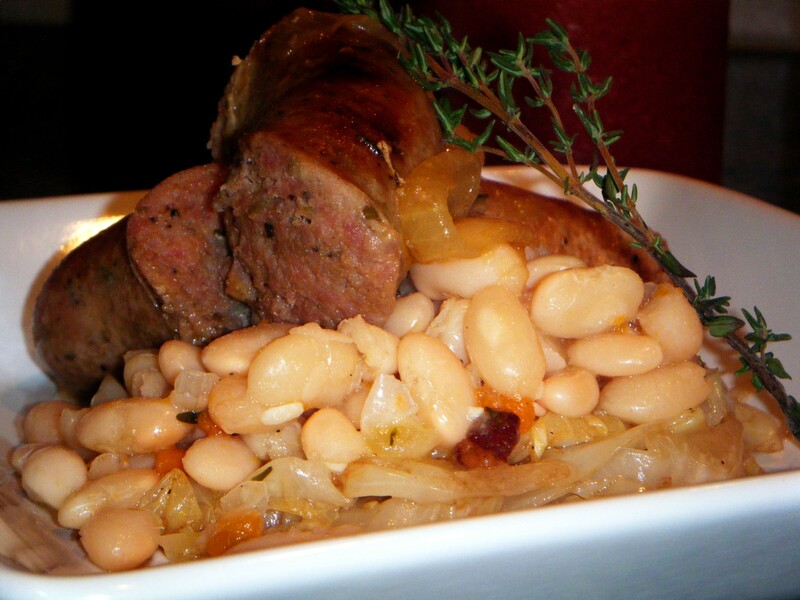 Those beans, paired with sausages braised with onions and served on top of a bit of cabbage with fried capers, make for a bowl of sustenance good enough to fend off any nasty old ice storm. And the leftovers are perfect for tea the next day. I grew up eating breakfast tacos. Notice I did not refer to these as breakfast “burritos.” You won’t find vegetables in these. They are not some sort of fancy omelet in a flour tortilla. 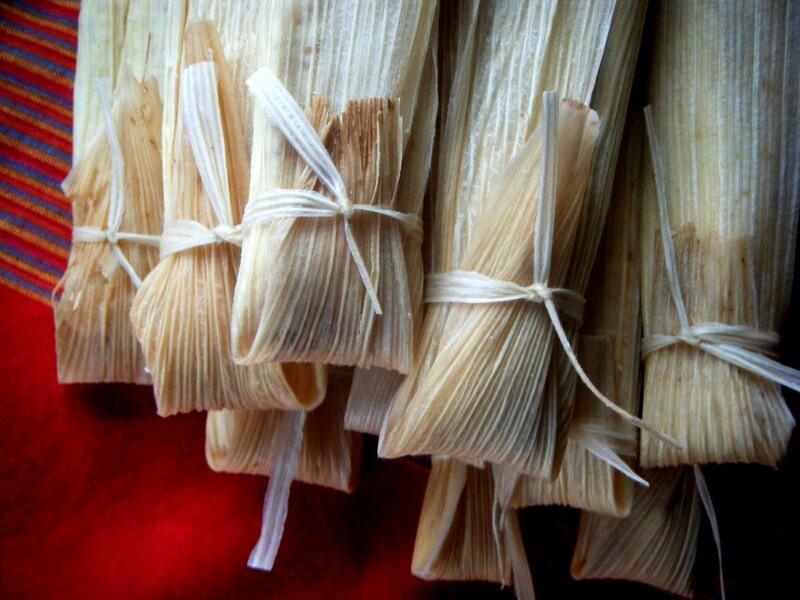 They are typically leftovers and eggs wrapped in a warm flour tortilla. They usually consist of some combination of the following : Meat (carnitas, chorizo, bacon, brisket, carne guisada), beans (usually refried), cheese (usually grated cheddar), potatoes, and eggs (scrambled). In San Antonio, where I spent my early years, breakfast tacos are more popular than donuts. There are places you can pick up a dozen for work (you’ll always get brownie points for this). My favorite little taco place (read: hole in the wall) has housemade flour tortillas and a seemingly endless variety of fillings for your taco. My favorite: bean, egg and bacon. Small (not burrito sized, y’all) flour tortillas (I heat mine directly over my gas burners on the stove. Use tongs if you must, but I’ve got asbestos fingers and do it by touch, flipping and rotating until they bubble). 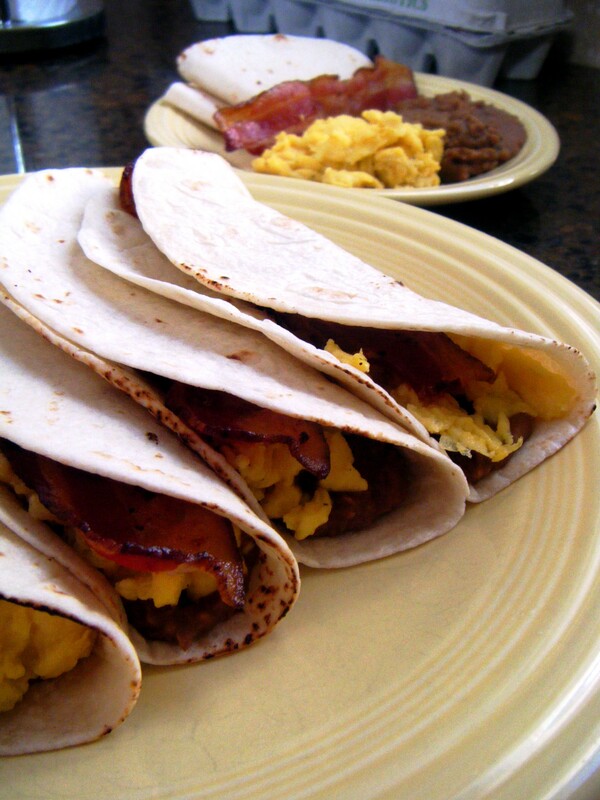 Assemble your taco with a base of beans, a spoonful of egg and a slice of bacon. Fold in half as you would a soft taco. Nothing more complicated than that. Serve with hot sauce or pico de gallo. This morning I didn’t have salsa so I used Sriracha for the heat. Playlist included Give Back the Key to My Heart, by San Antonio boy, Doug Sahm. Every winter kitchen needs a good, sturdy soup. 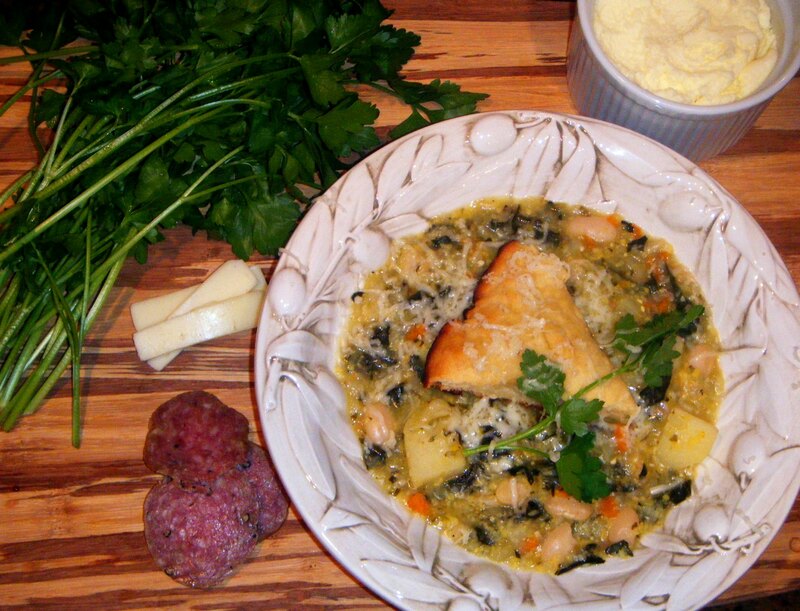 This zuppa, made with lacinato kale, pancetta and fennel, is amazingly versatile. The leftovers even result in perfect little hors d’oeuvres. Who knew? While this recipe contains the classic French base (i.e., carrot, onion, celery), the ingredients are cooked slightly differently than most other soups I make resulting in a surprisingly different flavor. Regional and cultural differences in cooking techniques really get me going. This is because I am a food nerd, but again, you all know this. You don’t have to be, though, to enjoy this truly delicious Italian soup.